Cheney Blasts House Democrats For Undermining the Troops! 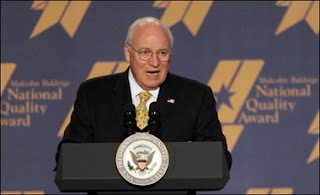 Cheney blasts democrats over their Failure Planning! VP Cheney blasted democrats for undermining the troops in Iraq during his talk to the Republican Jewish Coalition Leadership in Florida, yesterday. Progress in the cause of security and long-term peace never comes easily. It requires moral clarity, the courage of our convictions, a willingness to act when action is necessary, and a refusal to submit to any form of intimidation, ever. We persevere because we are the prime targets of a terror movement that is global in nature and global in its ambitions. The most common myth is that Iraq has nothing to do with the global war on terror. Opponents of our military action there have called Iraq a diversion from the real conflict, a distraction from the business of fighting and defeating bin Laden and al Qaeda. We hear this over and over again — not as an argument, but as an assertion meant to close off argument. Yet the critics conveniently disregard the words of bin Laden himself: “The most… serious issue today for the whole world,” he said, “is this Third World War…[that is] raging in [Iraq].” He calls it “a war of destiny between infidelity and Islam.” He said, “The whole world is watching this war,” and that it will end in “victory and glory or misery and humiliation.” And in words directed at the American people, Osama bin Laden declares, quote, “The war is for you or for us to win. If we win it, it means your defeat and disgrace forever.” This leader of al Qaeda has referred to Baghdad as the capital of the Caliphate. He has also said, and I quote, “Success in Baghdad will be success for the United States. Failure in Iraq is the failure of the United States. Their defeat in Iraq will mean defeat in all their wars.” End quote. Yesterday, the House Democrats passed the defense appropriations supplemental to fund our troops in Afghanistan and Iraq. This will hamper the war effort and interfere with the operational authority of the President with our military commanders. It’s counterproductive, it sends exactly the wrong message because of the limitations that are written into the legislation. When members of Congress pursue an anti-war strategy that’s been called “slow bleed,” they’re not supporting the troops, they’re undermining them. And when members of Congress speak not of victory but of time limits, deadlines, or other arbitrary measures, they’re telling the enemy simply to run out the clock and wait us out. Cheney assured Americans that there would be no early pullout from Iraq as democrats have planned.